Can someone sell me a copy of a modern, reliable Russia Revenues catalogue, in Russian? For many purposes, it is convenient to use John Barefoot's English language Russian Revenues, but unfortunately the very hard-working and conscientious editor of this book was provided with "information" on bogus "Revenues", produced - I believe - in the last twenty years, and persuaded to list them (Armenia, RSFSR, Ukraine listings are affected). At the same time, the listing of genuine issues is far from complete. For example, Imperial Russian Theatre Tax revenues (the "Maria Fedorovna" issues) include the unlisted set of eleven shown above which according to the Spravochnik catalogue date from 1915. The higher values of this set seem quite scarce. Also unlisted is the 2 [kopeck] brown stamp shown bottom right which is a Theatre Tax stamp from HARBIN, but I have no idea from what date. The high quality printing, with security network,perforation and gumming makes it look like a production of the St Petersburg Printing Works. Any information? There were copies in the Agathon and Oleg Faberge Fiscal collection. 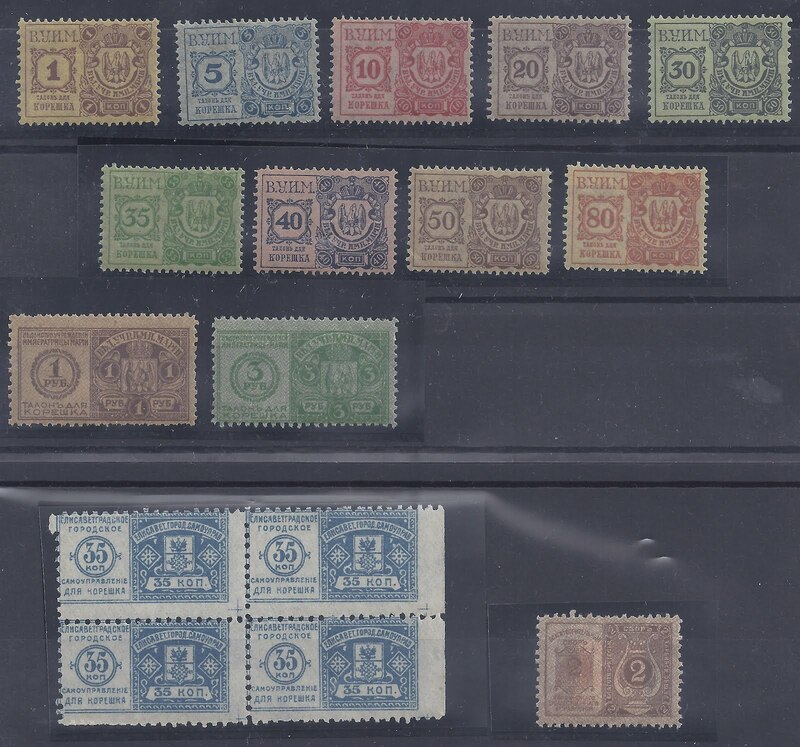 Barefoot does list the 35 kopeck blue stamp from Elisavetgrad which he tentatively dates at 1910 and which I show above in a block of 4. It seems to be quite common. It looks like a local printing and both the format and inscriptions imitate the regular Theatre Tax stamps (for example, "KORESHKA" for "Counterfoil"). But is it a Theatre Tax stamp? 35 kopecks seems a lot of money. Maybe this stamp also dates from the Civil War period rather than 1910 when 35 kopecks would be a large amount of money. Any information? We are working on a new edition, in colour, of "Russia Revenues" (slow and steady work, lots to do!). 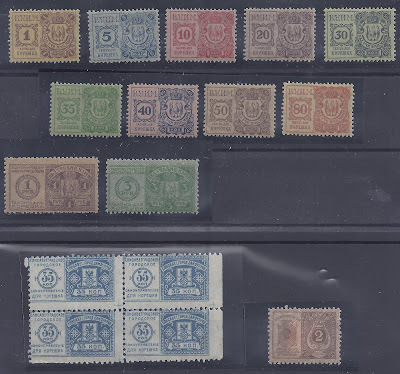 We need improved images of many municipal stamps - if any readers can help with scans, please contact me at JBarefootL@AOL.com The end result may be a few years away, but all new information will help collectors of russian revenue stamps.